The view of the footwell. Notice the exposed carbon fiber tub. The metal rod running into the center of the frame is the steering column. Mounted in the middle is a data logger: this car is Ariel’s demonstrator. Mounted in the middle is a 2-liter 300 HP supercharged Honda K20Z engine, originally intended for the Japanese domestic market. Closeup of the terminus of the steering column. You can see it move when the vehicle is in motion. The view from the passenger seat. Passengers get their own windshieldlets, along with a glorious view of moving machinery in close proximity to their feet. 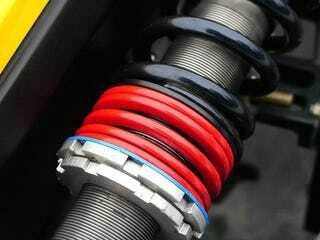 The adjustment ring on the Bilstein suspension. You can adjust the firmness on every wheel separately with these rings. The tires installed for the trackday were these rather slick ones, with a minimal tread. Of note is the instrument on the left, which approaches Honda-happy five digits. Double unequal length wishbones suspend the car both in the front and in the rear. Carbon fiber is everywhere. This is the surface of the mudguard above the front left wheel. As befits a development car, you don’t need to search long for a serial port, used by the data logger installed between the seats.